There’s no professional qualification or academic courses for price action trading. Yet, you’re expected to know what’s going on in a market with just one input: price. Not only that, you must make money off your interpretation of price action. Price action is simple, but being a price action trader is tough. In real trading, memorising candlesticks and bar patterns is not enough. You must have a set of price action skills that you can apply to any market to make sense of it. I’ve identified five skills all price action traders should have. To be a great price action trader, you need to hone and excel in these five skills. Market prices move in swings. These swings define the market structure. They form the basis of market support and resistance. The market structure is like your battle field. It is the terrain in which you will fight against your enemies. The more you understand it, the greater your advantage. The two examples below come from the 6E futures 10-minute frame. Regardless of how you define swing pivots, these two points were definitely major swing lows. Despite the rapid selloff, the market found support around the support area. 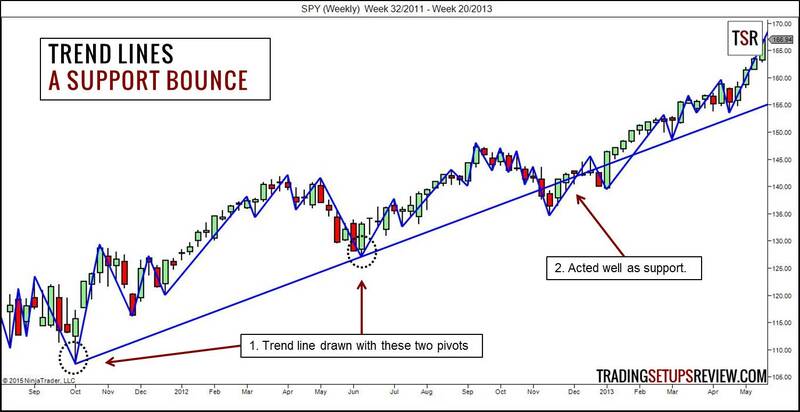 This downwards trend is enlarged in the chart below. Observe the swing highs and swing lows. They went lower and lower. Attempts to rise above the previous swing high were rejected. A clear downwards trend. Support area projected from earlier major swing lows. Some methods of marking swing pivots are Gann Swings and Percentage Swings (Zigzag Indicator). Like everything in trading, no method is perfect. Just pick one way to define market swings and stick to it. 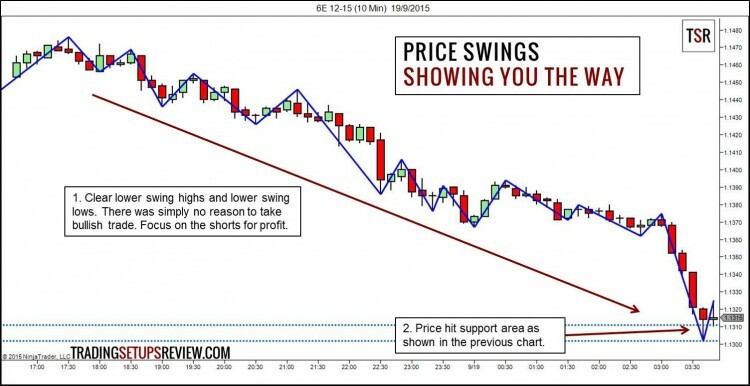 See how the market structure of price swings works with a popular candlestick pattern. Drawing trend lines is the natural progression from price swings. To get a trend line, just connect your swing pivots and extend the resulting line to the right of your chart. Trend lines tell you which direction to trade in. Trend lines act as support and resistance. Trend lines give you a sense of trend momentum. Don’t leave your trend lines behind. 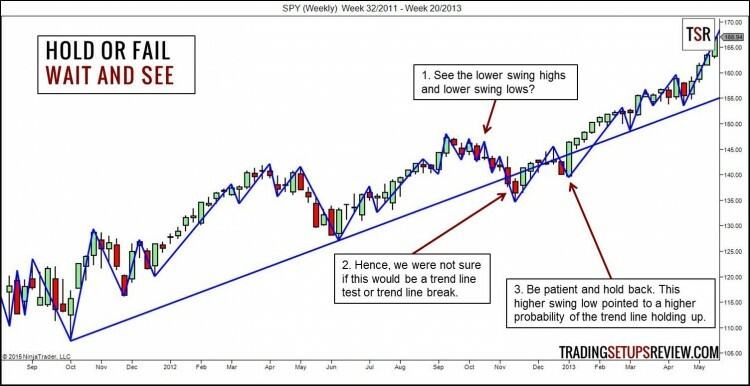 If you adore trend lines, take a look at Andrew’s Pitchfork. It combines swing pivots and trend lines into an elegant trading tool. 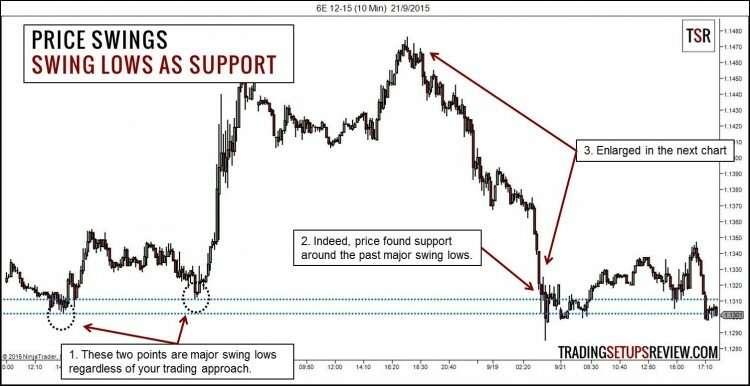 What are support and resistance? Do they always fulfill their role as support and resistance? Are these supposed support and resistance levels 100% reliable? If you expect a support to hold, you will buy as the market tests the support area. If you expect a support area to fail, you will sell as the market breaks below the support zone. Hold or fail. It affects your trading strategy. The key to a correct judgement is patience. When in doubt, waiting for more price action clues is the best course of action. The lower swing highs and lower swing lows seem to imply a bearish turn. With the solid downthrust breaking the trend line, we were not sure if it was still an effective support. A patient trader would have held back until this higher swing low formed. It confirmed that the bulls were still hanging around. There are micro price order flows you need to detect. Buying and selling pressure at critical price points help to refine your trade entries. Having a refined entry means taking on less risk and whipsaws for each trade. 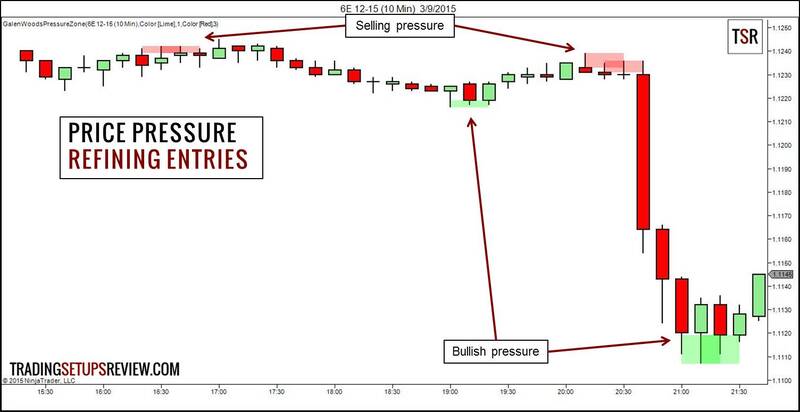 Do you see the bullish and bearish pressure in the chart below? How do you recognise buying and selling pressure? Most price action traders use rigid price patterns to find buying and selling pressure. But memorising price patterns is not enough. You need to understand the psychology and rationale behind each price pattern. Break down each price bar: high, low, close, upper shadow, lower shadow, range. Study each price bar with respect to the preceding bar. Understand what makes them work. Know when they work. Only then, you can recognise buying and selling pressure in real-time trading. Taking profits is a skill that is often neglected. What you need to realise is that most trades can be profitable, given the right price target. Finding a realistic target based on price action is critical. This is especially so for short-term technical trading. There are three broad categories of targeting techniques. Placing target with some measure of volatility like ATR or standard deviation. Profits do not take care of themselves. You have to grab them off the table. Here are 10 ways for a trader to take profit. Being a price action trader doesn’t just mean knowing what’s an Engulfing candlestick pattern, or a Head & Shoulders chart formation. As you can see, a good price trader needs to do different types of analysis. If you want to be a great price action trader, who produces consistent profits without relying on luck, you need to be more skillful than almost all other traders. At least better than the 80% that lost the trading game. It’s not easy, but it’s possible if you’re gritty enough. Finally, don’t try to learn everything at the same time. Start with understanding the bigger picture of market bias. Know what price is doing now. Then, move on to find trade entries and exits. Most traders start from finding entries, ignoring the market context. Most traders fail. 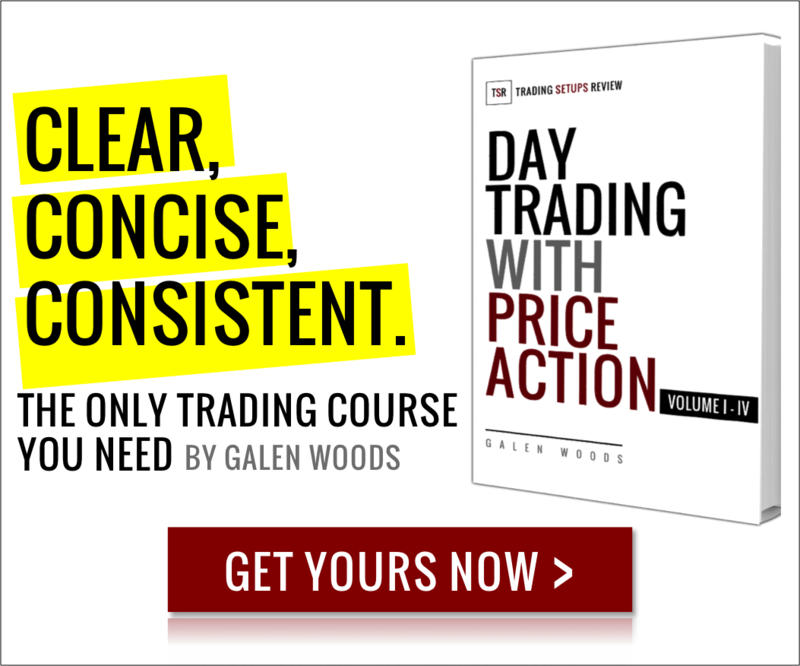 If you want an organised way to pick up these price action trading skills, check out my price action trading course. Thanks for the comment, Frank. Good trading! Sure! They contain the same price details. The candle body contributes to the visual difference, but there’s no material difference to a price action trader.